DIRECTOR'S CHAIR www.postmagazine.com 18 POST OCTOBER 2016 t's been quite a year for Marvel and Disney. Captain America: Civil War — so far the year's biggest global hit — has grossed well over one billion dollars world- wide, and now comes another superhero movie from the successful partnership, the psychedelic, mind-bending Doctor Strange, which promises to live up to its name. Directed and co-written by Scott Derrickson, whose credits include Sinister and The Exorcism of Emily Rose, the film tells the story of world-famous neuro- surgeon Dr. Stephen Strange, whose life changes forever after a horrific car accident robs him of the use of his hands. When traditional medicine fails him, he is forced to look for healing, and hope, in an unlikely place — a mysterious enclave known as Kamar-Taj. He quickly learns that this is not just a center for healing, but also the front line of a battle against unseen dark forces bent on destroying our reality. Before long Strange — armed with newly acquired magical powers — is forced to choose whether to return to his life of fortune and status or leave it all behind to defend the world as the most powerful sorcerer in existence. Doctor Strange stars Benedict Cumberbatch in the title role, along with Chiwetel Ejiofor, Rachel McAdams, Benedict Wong, Michael Stuhlbarg, Scott Adkins, Benjamin Bratt, Mads Mikkelsen and Tilda Swinton, and features a team of filmmakers that includes DP Ben Davis (Guardians of the Galaxy), Oscar- nominated VFX supervisor Stephane Ceretti (Guardians of the Galaxy), and ed- itors Wyatt Smith (Thor: The Dark World) and Sabrina Plisco. Here, in an exclusive interview with Post, Derrickson, who was deep in post at press time, talks about making the movie and creating its cutting-edge visual effects. Dr. Strange is definitely not your usual superhero and this is definitely not your usual superhero movie. Was that the appeal of doing it? "Exactly that! 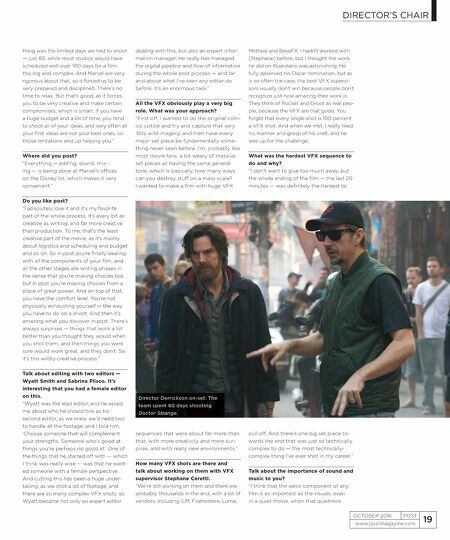 I always loved the 'Doctor Strange' comics because they were so wild and took all these psychedelic left turns in the Marvel universe, and I thought that the possibility of making a film that did the same thing would be a fun challenge." What sort of film did you set out to make and did Marvel set any limitations on what you could do? "No limitations at all. When I first met with them, I told them I wanted to make an acid-trip, mind-bending, wild psychedelic spectacle, action film about this character overcoming himself, but that it'd also be a very intimate story about one man and how he transforms. And that's certainly the movie we made. And in terms of all the VFX and the huge set pieces, the goal was really twofold; one was to draw heavily on the visuals of the original comics, because I think they had this tremendous visual ambition that was truly art of the highest quality, and that ambition still stands on its own, so I loved the idea of trying to bring some of that ambition to the screen. And I wanted to use big budget, cutting-edge VFX to create stuff that's never been done before, instead of using them just as vehi- cles of destruction." What were the main technical challenges of pulling it all together? "Definitely dealing with all the VFX, and trying to create things that people have never seen before, and doing big set piec- es that are about things other than tons of gunfire and massive explosions. And when you try to do that, you're left with things that really have to be carefully designed, shot by shot, with great specificity. And that was a very long, laborious process." Did you do a lot of previs? "A lot, as there was no other way to pull off some of the sequences, and The Third Floor did most of it." How early on did you start integrating post and all the VFX? "Very early on in pre-production, and we started on it all the moment we had a working draft — way before we got through the development process. It was an interesting experience, because when you're dealing with world-class previs artists, they love to create and push the boundaries of what's been done before and come up with really great ideas. So a lot of times, an individual artist would come up with an idea and I'd look at it and go, 'That's fantastic! Let's run with it.' So it became a very synergistic process, doing all the previs and storyboards." You shot on location all over the world, including in Kathmandu, the UK and China. How tough was the shoot? "It actually wasn't that difficult because Marvel's very disciplined. 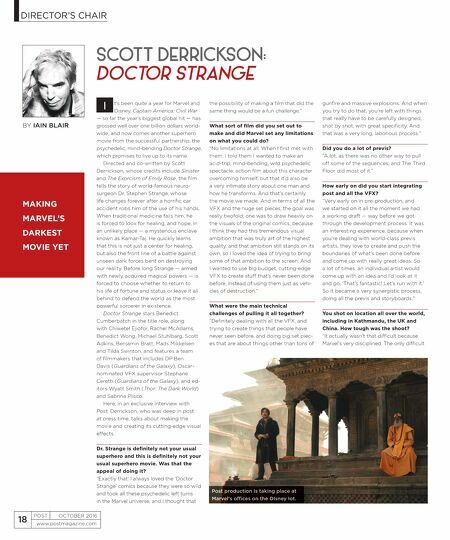 The only difficult SCOTT DERRICKSON: DOCTOR STRANGE MAKING MARVEL'S DARKEST MOVIE YET BY IAIN BLAIR I Post production is taking place at Marvel's offices on the DIsney lot.